The fine folks at Boylan wrote me the other day and asked if they could send a four pack of their new Spring Seasonal - Shirley Temple over for review. Having enjoyed Boylan’s before, I of course lept at the opportunity and now here I sit with Boylan Shirley Temple in front of me. 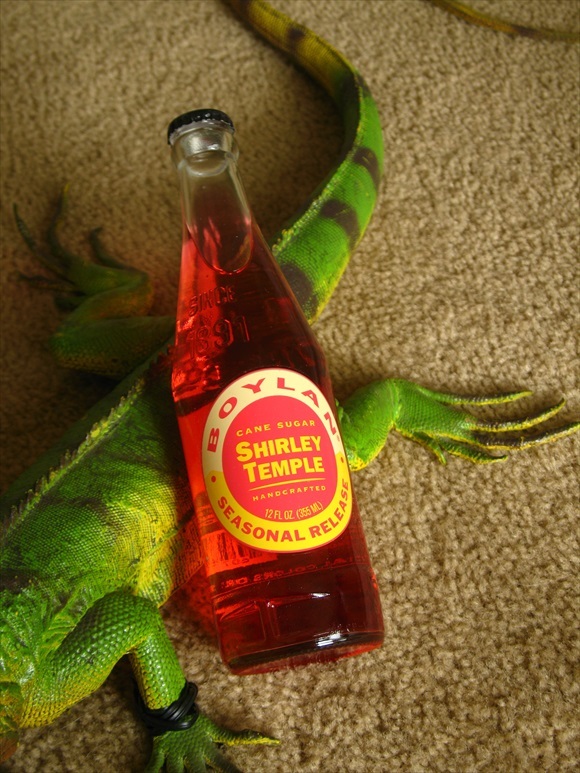 If you’re not familiar with what a Shirley Temple is besides the cutest little star this side of 1934, I’ll tell you. A Shirley Temple is a non-alcoholic beverage made with ginger-ale, a splash of grenadine, and a couple of maraschino cherries. That is the classic recipe at least. Nowadays the ginger ale is usually substituted with a lemon/lime soda for a reason unknown to me. Well bottlers at Boylan decided it’d be a great idea to bottle this flavor and once again here I sit ready to drink this cane sugar sweetened concoction. The color of the liquid is a beautiful shade of rose. The classic Boylan label adorns the bottle with a spring time color theme that seems very appropriate for the drink at hand. Enough waiting, more drinking. I wish I had a flower garden that smelled of Boylan Shirley Temple. A brisk cherry scent floated about until kissing my nose with delight. There’s also a hint of Twizzler which brings me back to reality and says that I should stay cautious. So very fizzy. The quick burst of cherry is almost immediately consumed by a flurry of tiny bubbles. When the chaos ends I’m happy to see that the cherry flavor has survived and is sitting happily upon my tongue awaiting my review. While the flavor does indeed linger after each sip it only overstays its welcome for a few moments. You see, the mouth-feel of Boylan Shirley Temple is very effervescent at first and only begins to weigh down near the conclusion of my sip. Unfortunately this involves the cherry taste building upon itself with subsequent sips which weakens the overall taste of the beverage. I’m not struggling to drink it by any means, but the first impression I got does not match my last. Thankfully the built up flavor never reaches a level of disgust, just unpleasantness. It’s difficult for fruit based sodas to avoid building upon themselves and I can only think of a few where it actually improves the taste of the beverage. I do wish the cherry flavoring tasted a bit more natural, but the flavor of maraschino cherries isn’t exactly found in nature. All in all Boylan Shirley Temple is a delightful beverage. While improvements could be made I don’t think I’d mind a pack being in my fridge right now.